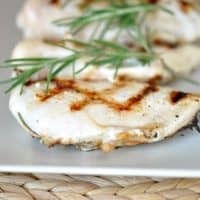 One of my favorite ways to prepare and grill chicken, this three-ingredient recipe provides unbelievable flavor and delicious tenderness to every day boneless, skinless chicken breasts. My Aunt Marilyn sent me the recipe eons ago and I’ve been thankful ever since. And lazy, too. I mean, what’s a girl to do when dinner only requires three ingredients? Sit around and eat bon-bons, that’s what. Oh. Right. Except that girl must live somewhere else and not be the blessed mother of four rugrats who refuse to let their mother sit and eat bon-bons. Even if dinner only requires three ingredients. Seriously, this chicken is a no-brainer. I have served it with everything from these sweet potato skewers (also grilled) and corn on the cob, to this Zucchini Mozzarella Medley (be still, my zucchini-smothered-in-cheese-loving heart), to this Black Bean and Corn Quinoa Salad, to this stuffed zucchini, to…well, you get the picture. Basically, by making this chicken and serving it with deliciously wonderful summer side dishes, I am inwardly screaming, “Summer, Don’t Leave Me!” I love me some summer food. Make it. And eat some bon-bons in my honor, while you are at it. This recipe is so flexible and easy you can double and triple to your heart’s delight. The idea is basic – just add enough buttermilk to cover the chicken and throw in as much rosemary as your soul can take. I like a lot of rosemary flavor. Use what you like. This was delicious. We loved it. A simple week night meal. The chicken was so tender. We served it with your garlic and Parmesan mashed red potatoes and some green beans. Another keeper. Thanks! Every recipe I have tried from your site is a success! I trust that this is the same. Is fresh rosemary crucial to this recipe or would using dried make much of a difference? 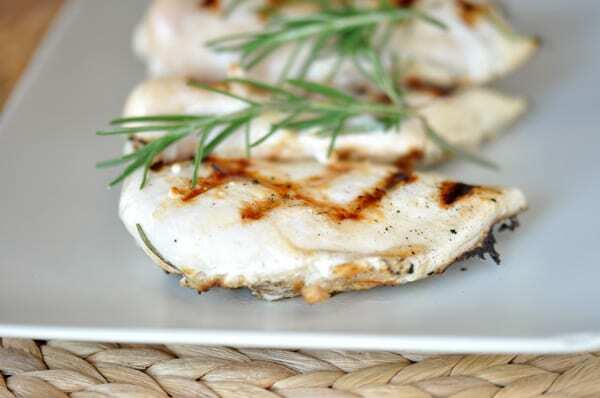 jen – I’d definitely say the fresh rosemary makes this dish because the flavor infuses the chicken more than dried would. embarrassing question, but what is a sprig? what part of the rosemary is that or is it a whole little branch? Melissa – Don’t be embarrassed, that is a good question! A sprig is one little branch and all the leaves. Embarrassing question, but is a sprig of rosemary the like whole little branch, or a few leaves from it? Basically, what’s a sprig? Fast, easy,delicious,and clean-up is a breeze. Another winner. You never cease to amaze me. My husband and I loved it. This will be a frequent item on our menu. Thanks Mel. I just came upon your website a few days ago. I love that your recipes have a short list of ingredients, are uncomplicated, and print on one piece of paper. I am about to try the Grilled Island Chicken tonight. I have been married 49 years and still love learning new things. Thanks. I have been making this exact chicken for years!! So incredibly delicious and super easy when things are hectic! So glad you’re sharing it! the buttermilk is a wonder of an ingredient, and i love the rosemary usage. in moderation, it’s my second favorite herb. Great weeknight go to recipe!! This looks so yummy! Does the fat content of the buttermilk matter? What kind do you use? Hillary – I always use regular ol’ lowfat buttermilk. wow! this sounds like such a simple, yummy dish. I LOVE rosemary, and am always looking for recipes to use it up, when I have to buy a whole container of it for another recipe that only uses a few tsps (it’s the same w/ buttermilk, so many recipes only call for a small amount and I have the rest of a quart in my fridge). I would think this chicken would be pretty bland, I never make anything with only 3 ingredients…have you ever added garlic or salt & pepper to the marinade? I’m definitely going to give this a try. Kaitlyn – I’ve never added any other spices but you surely could. It is a very simple marinade you could doctor up in any number of ways. Do you salt and pepper the chicken? Amy – you could definitely salt and pepper the chicken right before grilling (after you pull it out of the marinade). The buttermilk is lightly salty enough that I didn’t, but either way is delicious. This is a really gentle simple marinade that isn’t overpowering so if you want more flavors, you could play around with it. A buttermilk brine…genious! 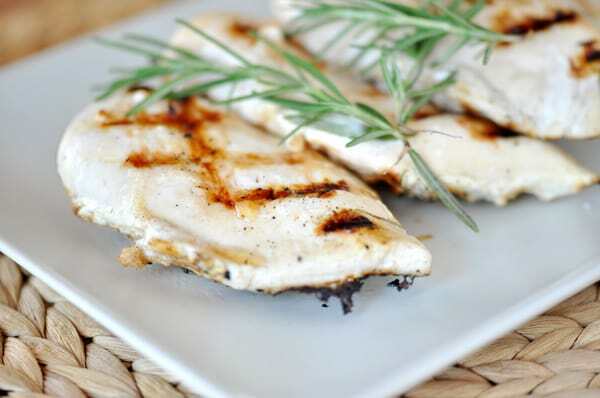 I love rosemary, and I can just imagine how delicious this chicken is! I have a quart of buttermilk in my fridge, and I know just what I am making for dinner tonight- thanks, Melanie!